An attempt by an American student housing REIT to convert hotels in downtown Montreal into upscale student housing has been a monumental failure, the company’s latest leasing figures indicate. Campus Crest Communities, which owns a US $2 billion student housing portfolio, transformed the Delta and Holiday Inn Midtown into student residences last year. The Charlotte, N.C.-based company formed joint ventures with European private-equity firm Beaumont Partners SA to acquire the hotels for about US $120 million and develop them into student housing under the Evo brand. The high amenity Evo Centre-Ville and Evo Vieux-Montréal projects include such features as indoor pools, state-of-the-art gym, Lavazza coffee bars, Pilates and game rooms, tanning beds and 80-inch TVs on every floor. Single rooms rent for $1,075 per month, while double room go for $675. But despite the frills, Campus Crest’s 2014-15 leasing results showed only 242 beds out of 2,223, or 10.9 per cent, were occupied in the two Montreal Evos as of Sept. 30, 2014. The U.S. publication Commercial Property Executive reported delayed renovations partly explained the extremely low leasing at the start of September’s school year. And it was puzzled by the company’s venture into Canada when there were plenty of dorms that could be filled up in the U.S. Newly released figures show things have improved only slightly since last September for the Montreal Evos. 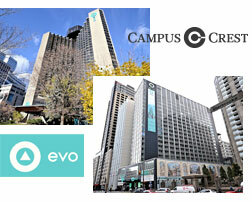 In late May, Campus Crest released updated 2015-16 pre-leasing results as of May 18, indicating its Evo Montreal properties are only 14.6 per cent pre-leased for the 2015-16 academic year. While Campus Crest had been banking on the fact there are 200,000 post-secondary students in Montreal and far too few campus residences to hold them, it has yet to work out that way. That’s despite the fact the REIT has ramped up its marketing activities to increase student interest in Evo Montreal. During the winter, Evo Montreal was one of the sponsors of what was dubbed the “world’s largest toga party” an attempt to break a Guinness World Record. And in April, it gave free tickets to the EvoHouse party to students who passed by one of the residences and held the annual McGill varsity sports awards gala at one of its residences. Ryan Burke, a REIT analyst with Newport Beach, Calif.–based Green Street Advisors, told the U.S. publication Multifamily Executive earlier this year Campus Crest erred because “they tried to enter the Canadian market in quick fashion. While the two Evos in Montreal have so far been a failure, another Evo in Philadelphia is doing much better. The 33-storey, 850-bed tower which is 30% owned by Campus Crest, was only 48% leased at the beginning of the school year last September. According to the company’s updated 2015-16 pre-leasing results, that number has jumped to 89.5% for the 2015-16 academic year. Aside from the high-rise, upscale Evo properties, Campus Crest operates more conventional Grove residences, in which students have private bedrooms and bathrooms and share common spaces, and Copper Beach, a townhome community brand. Green Street Advisors, which specializes in REIT analysis, calls Campus Crest’s existence as a public company “a resounding failure” since its October 2010 IPO. In its latest report on Campus Crest last February, Green Street calls the company the “worst performer” among the companies it covers. Still, the stock analyst rates Campus Crest a hold, saying there is a good chance the company will be sold. Poor management has been cited to explain Campus Crest’s performance and the company has undergone a significant amount of management upheaval in the last several months. CEO Ted Rollins and CFO Donnie Bobbit stepped down last year as the company announced a “strategic repositioning.” Richard Kahlbaugh, lead independent director, stepped in as executive chairman and interim CEO and Aaron Halfacre joined as chief investment officer. In late April, Campus Crest retained Alvarez & Marsal, a management consulting firm, “to improve operational efficiency, drive profitable growth and deliver maximum shareholder value.” Two Alvarez & Marsal managing directors were also named to the Campus Crest board.